Sorry for the absence, I've been on the Chevron Islands for five days... no telephone, no Internet... kind of. Actually just Chrevron Scarf craziness. 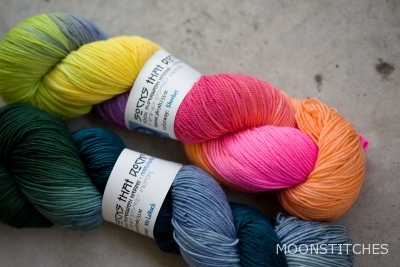 "[...] Furthermore I have a grudge against two balls of yarn I got in my mail yesterday... I wanted them to be contrasting... I wish I had went for something more subtle, way more subtle... this combination is a bit more than I can imagine wearing... yes, a Chevron Scarf it shall be, you guessed right. I do have the hope these colours I am not liking now are exact the colours that need each other and will work out fine but to believe this I must see it.[...]" I said I went for contrast... got pretty much... thought "Ew." but wanted to give it a try. So I tried, had to cast on several times because I kept on losing stitches, after a while I managed to avoid that but when they stayed on the needles (circular, 3.6mm, bamboo) and I had knitted several repeats the pattern looked very odd, all curly... 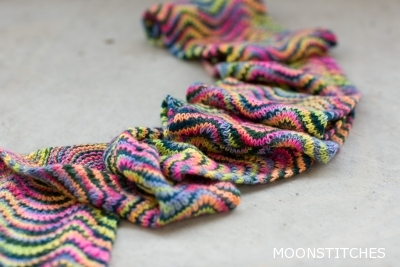 I read the pattern again and discovered that it did not consist of two rows but of four... I did the increase and decrease every other row because I certainly didn't read the whole pattern before casting on... So I ripped it and started again on Friday, considering taming the Sherbet with some Koigu I was awaiting later that day. By then I had found this here... But when my Koigu arrived Friday afternoon I knew at once the Ms LaRock had to get along with that crazy Sherbet and no one else. So I kept on knitting. From time to time I looked up and actually said "Ew. Neon." yet I kept on knitting. Knowing, if I didn't finish this scarf in one go I never would. Besides, I still had hope the finished object would look alright. I do not like the colour combination too much, eggplanty shades or brownish tones were much better partners for the Sherbet, I think, but I wear a lot of brown so the scarf's colours are not all wrong. And the striping that's going on is working just fine. And, oh, the wrong side of the scarf actually looks so right! I love how the colours are blending there. The scarf got a little long, 220cm (something I tend to do when I am not too fond of a thing: I try harder - as long as it is craft related), still about 50g of each skein left - the yarn is really great, has a nice twist and smells wonderful when getting wet. 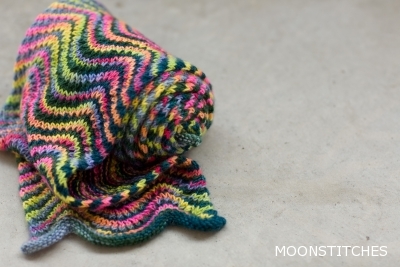 And yes, I am happy I have a Chevron Scarf now, even when it is a neon beast like this. I am looking forward to my next Chevron though... must try the Koigu.